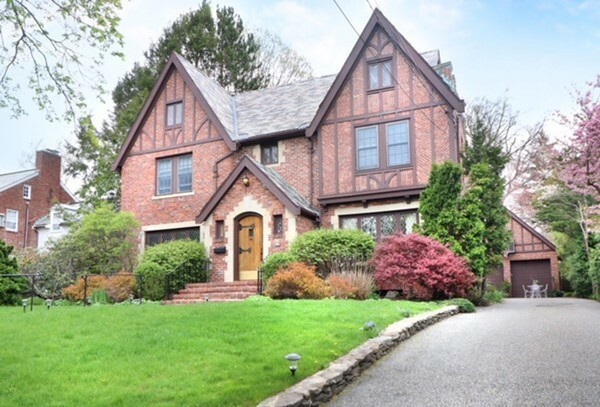 Beautiful and very bright brick Tudor on a quiet dead-end street located close to the Ward School and the Mass Pike. A charming entryway leads to a gracious staircase and oversize wood beamed living room. Open family room off the kitchen offers exceptional light and views of the enclosed yard and beautiful landscaping with informal dining as well. The renovated, well designed kitchen boasts subzero refrigerator, stone counters, and tile back splash. The spacious dining room with detailed woodwork is warm and inviting. Custom master suite with lots of storage and built-ins. Two additional bedrooms with great closets on the second level as well as a very nice sitting area. The lower level is completely finished with a great playroom, full bath, office, an additional bedroom and storage. A beautifully maintained home sure to please all. as well as painting will be done also.